You need to solve two big problems: 1) Create more quality sales pipeline, and 2) win more qualified opportunities already in the funnel. Welcome to a modern approach to business-to-business (B2B) selling that delivers sustained positive results. Here you'll find methodologies for building pipeline with COMBO Prospecting and managing complex sales with the RSVPselling™ framework. Everything here is proven to improve sales execution and enterprise win rates to drive profitable revenue growth in competitive markets. COMBO prospecting with 'Strategic Social Selling' is the modernized way for salespeople to build strong sales pipelines through executive engagement with key decision-makers and influencers. Leverage the power of proven techniques combined with the latest technologies and tools including LinkedIn and other platforms. RSVPselling™ has delivered hundreds of millions of dollars in complex wins for enterprises around the world. Manage deal complexity with an intuitive framework for covering relationships, developing strategy, creating customer value and aligning with the buyer's evaluation, selection and procurement processes. Sales Enablement happens best with the right sales methodology driving your unique sales processes embedded within your Customer Relationship Management (CRM) system. This provides transparent opportunity coaching to deliver greater sales success and predictable revenue with accurate forecasting. Tony is an experienced CEO and company director who brings proven leadership in building great culture and driving profitable revenue through customer success. With thirty-five years of experience in sales and business leadership, Tony holds individual and team performance records that have never been broken and has developed frameworks for modernizing the creation of quality sales pipeline and the way complex enterprise sales opportunities are managed to increase win rates. He is ranked by Top Sales Magazine as the most influential person in professional selling in Asia-Pacific and teaches 'modernized selling' within the MBA program at the University of Technology, Sydney. Tony is also a best selling author and twice ranked the #1 sales blogger globally in 2017. He was also recognized by LinkedIn as the #3 expert though leader globally on B2B sales in 2018. He has more than 350,000 followers of his blogs and Tony’s first book is a business bestseller with his second book, COMBO Prospecting, published by The American Management Association. Tony has served as Director of Sales for public corporations and as the Asia-pacific Managing Director for a number of tier-one global technology companies. Tony speaks at conferences internationally including for Salesforce World Tour events and sits on a number of advisory boards. His clients include Schneider Electric, New Zealand Government, Salesforce, TAL Life, Zip Water, Findex, BAE Systems, Flight Centre Travel Group, Red Hat and UBT with their 4,000 member companies globally. 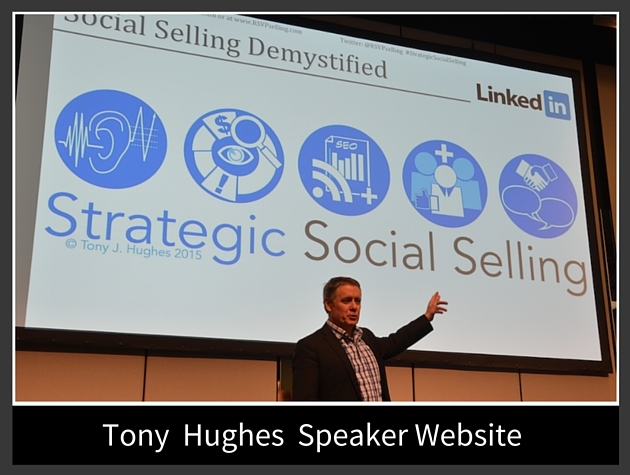 Tony’s articles can be read on his award winning LinkedIn Blog and he can also be found at his author and public speaker website.